(Reuters) - South Africa's Kevin Anderson made a winning return to competition at the Miami Open with a hard-fought victory over rising Spaniard Jaume Munar on Saturday. 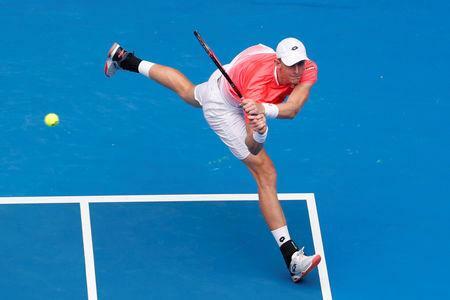 After more than two months away from the court with an elbow injury, the world number seven outlasted the 21-year-old Munar 6-4 3-6 6-3 in their second round clash. In his first tournament appearance since the Australian Open in January, the big-serving Wimbledon finalist boomed down 17 aces while converting three of his seven break chances. "It was all good and I was really pleased with the way [the elbow] felt," sixth seed Anderson said. "To get through in three sets, it felt really good to be back out there. I'm happy with how the elbow responded. I feel like I'm hitting the ball great. "It's always different playing matches than hitting in practice, but I've been able to up my load and how much I'm able to serve. That's really encouraging and that's why I felt good coming into this week. "I've been able to do everything but hit serves recently. I always had the confidence that as soon as I got over that hurdle, I was going to find my form pretty quickly." Two of Russia's young prospects, Karen Khachanov and Daniil Medvedev, were also Saturday winners. The 10th seed Khachanov beat Australian Jordan Thompson 6-2 6-3 while his friend Medvedev, the 13th seed, toppled France's Adrian Mannarino 6-2 6-1.